Well, the time finally came on Valentine’s day to take the children to their first movie in a movie theater. As most of you know the children have been going to Waldorf schools, where media use, especially television, is strongly discouraged. As a family we’ve been following that advice and the children have only seen television extraordinarily rarely (Olympics! ), and over the last year we added in movies every once in a while. Having this low-media household has helped the children be able to entertain themselves, be more active, and not to be caught up in consumerism, among other things. I could write a lot more about how I think it has helped the children, but for now you could take a look at Taming The Media Monster and TurnOffYourTV.com, and you can see a comprehensive school media policy, too. All that said, since we’ve not been so strict on any policies while on our trip, it seemed like a good opportunity to see the inside of a theater for the first time. We went with our friends Miki and her twins Aurora and Bella to see Bolt. 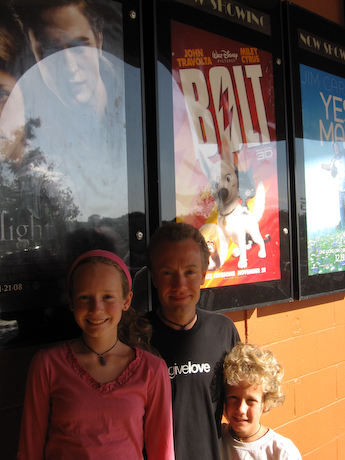 Had I known a bit more about it, Bolt wouldn’t have been the first movie that I would have picked to have them see, as I found it a bit of an intense movie in some places, but it did make good use of the surround sound of the theater, so it was nice for the kids to experience that. And they enjoyed the movie. It was about a dog who thinks he is a superhero who gets lost and has to make his way back home to his waiting owner, and the adventures that ensue on the road. It had interesting, if bittersweet, parallels to our own adventure. This, I guess, was the first of our Orlando Entertainment Extravaganza. Fully Awesome!